Living by the ocean, it is amazing to me that when I go to the corporate-owned supermarket the only seafood available is imported and most likely farmed. To get local fresh fish one needs to go find the guys with coolers on the street corner or small fish stalls. While for most of us fish is an occasional meal, chicken, beef and pork being the most common protein in the North American diet, for much of the world fish is a main staple. About 1 billion people largely in developing countries rely on fish as their primary animal protein source. In 2010, fish provided more than 2.9 billion people with almost 20% of their intake of animal protein, and 4.3 billion people with about 15 % of such protein. At Café Juanita and Frida’s Fish Taco Food Truck, we are committed to only serving locally caught fish. This means occasionally not having fish or at times ‘making do’ with fish that are less popular. When I first moved to Southern Mexico almost 20 years ago the waters were abundant with marine life. My then-husband routinely went diving for lobster, came home with fresh yellow fin tuna or amberjack. In the past few years I have noticed a large decline in the amount and variety of fish available. Part of this is due to warmer waters and less cold currents that my favorite fish favor. Causes of this are global warming, overfishing by large-scale fisheries, pollution and contamination. A few things you can do to protect the ocean and guarantee delicious fish tacos will still be available in 20 years! Carbon dioxide from burning fossil fuels is making our oceans more acidic. One consequence could be the loss of corals on a global scale, as their calcium skeletons are weakened by the increasing acidity of the water. There are many simple ways you can reduce your energy use. Ride a bike, walk or use public transportation. Use high efficiency appliances in your home. Turn off appliances when they aren’t in use. Turn up your thermostat a few degrees in the summer and down a few degrees in the winter. Use compact fluorescent light bulbs in your house. Properly dispose of hazardous materials. Pick up garbage and litter near beaches. I am a dainty eater. Maybe discriminating is a better word. I don’t like to feel full, definitely not stuffed. I like to stop eating at the point where I feel sated but I might have a little more room in case something else is around the corner. Going to a restaurant with me can be annoying, occasionally I declare myself done after consuming only a third of what’s on the plate. I am specific about what I want….. no buffets, no overstuffed American-style plates that could feed a small village, no coffee in glass cups, toast must be buttered when it is hot- is there anything more depressing than unbuttered toast with a little-frozen package of butter on the plate? I don’t mind eating alone in restaurants. Books are always a good prop, I like the freedom to eat slowly and focus on the food. Especially if I am eating something so exquisite that it will make its way into my food memory hall of fame. Memories I pull out with relish and such detail that I can almost recreate the taste in my mind. So, despite being a dainty eater, I love food. It’s that I am in such awe of those perfect bites; a moment on your tongue, swallowed and then gone- that’s why it’s important to pay attention. People are always asking what I miss from Canada. Nothing really I say… but croissants. I didn’t even know how spoiled I was growing up in such an abundance of buttery lightness. My father would slip me a five dollar bill on Sunday mornings and send me to the family-run grocery store next door and I would come home with a half dozen croissants. This was our pre-breakfast… later would come brunch. The croissants were light and flaky, staining the brown paper bags they were served in and leaving crumbs between the plate and your mouth. These croissants didn’t need anything added; no jam or knives necessary- you pulled them apart with your fingers, the warm dough stretching and crumbling. Eating them was like not having a care in the world. When my daughter was little and we spent summers in Montreal, we would stop by the bakery after day camp; an almond croissant for her and a plain one for me. We were such frequent customers that the counter girl visited us in Mexico a couple of years later. 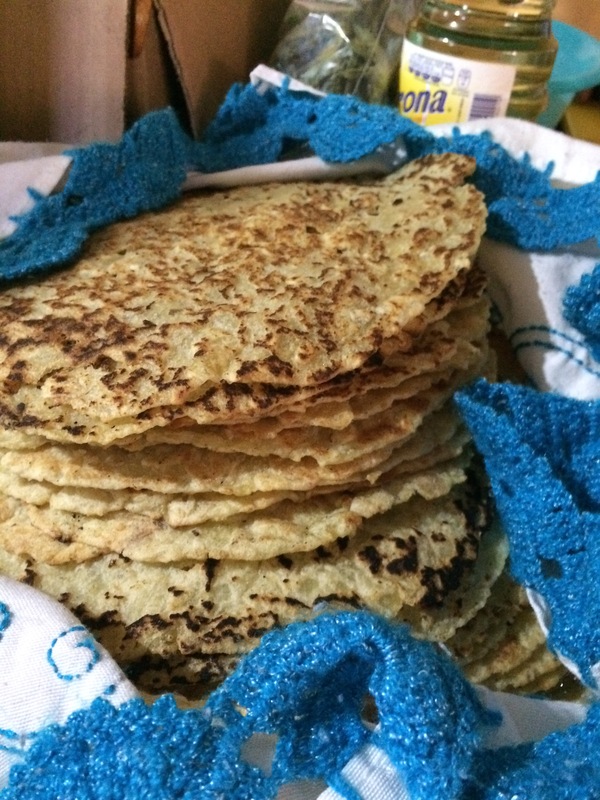 Recently, a friend of mine was driving me through the streets of Oaxaca on our way to breakfast when, over the smell of exhaust and city fumes, I caught the beckoning odor of butter and baking. I turned and saw something fleeting out of the corner of my eye- a small doorway. I hesitated for a moment, like when you see someone you might know but haven’t seen for a while and you are not sure if you should say hi. “Do you mind driving around the corner? Was that a bakery?” I said. My friend drove around the block and double parked outside the small door. “I’ll just be a moment,” I said. Yes, the smell of baking and butter hugged me. Baguettes lined the walls like old friends. Not supermarket–style baguettes- these were long and thin like elegant Frenchwomen’s arms. Pastries sat in baskets in a glass case. One solitary croissant smiled up at me and whispered ‘bonjour.’ I ordered fast, randomly pointing to a focaccia, almond croissants, and a sourdough. All packaged up in brown paper bags. Back in the car I pulled out the bag with the lone plain croissant and ripped off a piece for my friend. “Here, try this!” I said stuffing a piece into his mouth as he drove, then I ripped off a piece for myself, leaving flaky buttery crumbs all over the seat. The texture of the croissant was perfect and when I put it in my mouth I thought… Am I going to have to share the rest of this? I did… but I didn’t want to. While the classic lime margarita is always a good choice for summer, we have been looking for something a little more sophisticated- more Fresh than freshman. Huatulco’s tropical climate offers a plethora of fruits to play with. My two favorite cocktails for the summer season are the Watermelon Aperol Spritz and the Grapefruit Habanero Margarita. I first discovered the Aperol Spritz in Perugia, Italy after a harrowing 63 km bike ride. As I walked through the main plaza it seemed everyone was drinking an Aperol Spritz. Aperol is an low-alcohol aperitif, bright orange in color and infused with herbs and orange. I drank it the rest of the trip and when I returned home to Mexico I explored every avenue to get Aperol in Mexico. For the past few years it has been readily available in Super Che. While I love an Aperol Spritz, I find the prosecco can make it a bit boozy for an afternoon cocktail when I am craving something lighter that won’t put me to sleep. Mix and pour over crushed ice. Garnish with watermelon. For something more savory I love this Grapefruit Habanero Margarita! Mix and pour over crushed ice. Garnish with habanero and grapefuit. In the same way the simple pleasure of Proust’s madeleine led him down the road of memory, I can trace my relationship with mushrooms, and my refusal to eat them, as a road map through my childhood. My father, an animal psychologist and amateur mycologist was my first and best travel companion. He was often described as eccentric with his Albert Einstein hair, clothes that always looked as though he had just rolled out of bed and his plaid shirt pocket always with a Mont Blanc pen sticking out. When I was nine years old we rode the train across Canada to British Columbia where we stayed in a log cabin and he taught me how to fish. Before I went to University we explored the Cabot Trail and Peggy’s Cove and before my move to Mexico we went to Germany where we retraced memories of his childhood, eating in upscale restaurants and fancy hotels. “Always spend your money on good food” he liked to remind me when I was a struggling student. Augusts were reserved for the cottage, cottage being a too quaint word for the large house that we rented each summer. The furniture was from the 1940s, there was a record player and black and white photos of the original owners decorated the walls. My older brother and sister would come and go, but I would spend the whole month lying on the dock with the friends I met up with each year. My father spent his cottage days foraging for mushrooms. He left early in the morning with his wicker baskets and his walking stick, limping his way through the village and into the forest. He had his spots. My sister and I accompanied him but it was soon clear that my sister’s interest and knowledge about mushrooms far exceeded my own and I soon drifted away from these expeditions. Mushrooming wasn’t as exciting as fishing or swimming across the lake or losing myself in the pages of a book. Opting out, I became the frivolous daughter, the one who preferred hanging out on the dock or going to parties with the summer kids. My father and my sister would return in the afternoon, their baskets full with chanterelles and boletuses. There were stories of poisonous mushrooms that looked just like edible ones and of course there was Alice from Wonderland who found a mushroom that would make her grow bigger or smaller depending on which side she chose. I decided mushrooms were a very risky business and I refused to eat them. This presented a dilemma for my father who managed to incorporate mushrooms into every dinner. So for the month of August I lived on peanut butter toast, Bull’s Head ginger ale and the occasional all-dressed hot dog from Larry’s Snack Bar. My mushroom boycott was only second to my teenage vegetarianism as food protest, which ended our smoked pork excursions to Chinatown and devouring my father’s veal birds. Food was my teenage rebellion – that, and rolling my eyes at his repertoire of ‘fun guy- funghi’ jokes. I have become less rigid in my eating habits; being in the food business, I will try just about anything, but mushrooms still have a special place of mystery for me. I am not alluding here to any psychedelic varieties, I mean regular old portobellos, shiitakes and chanterelles – whose earthiness transports me back to those summer days. A few years ago when I first heard of the Wild Mushroom Festival in Cuajimoloyas, I immediately wanted to go. Each year, however, I found a reason that making the trip to Oaxaca for this two-day event, which includes mycologists, foraging and meals entirely prepared with mushrooms, was not possible. This year I went. I kept my mushroom reticence a secret, which was fine, as I have always liked a good secret. I would eat everything and smile. It was foggy and cold when we arrived in the town square of Cuajimoloyas that first day. I had travelled overnight and had been looking forward to ‘checking in’ to my cabin, but after a watery coffee we were asked to choose between the 3-hour or 5-hour walk and we were led into the woods. My inner voice was thirteen again but on the outside I smiled and walked along. The woods were like a movie set for a Grimms’ fairy tale, blanketed with pine needles, moss, lichens, succulents…. everything so moist and alive you could practically hear the mushrooms growing. Everyone in my group was collecting mushrooms with great enthusiasm. Within an hour our baskets were brimming. After five hours we gathered with the rest of the teams in a field for a picnic lunch. Each team’s mushrooms were laid out, examined and counted by the festival organizers and mycologists. My team collected over 223 different mushrooms – I didn’t even know such a thing was possible. Lunch was mushrooms in a red adobo sauce, which I ate with a smile, but was not enough to convince me that I could be a mushroom lover. After a good night’s sleep in a cocoon of blankets, I awoke refreshed and ready for day two, which was a series of workshops, discussions with mycologists and cooking. Vendors had set up stalls in the town square and the products ranged from woolen hats (I bought one the first day and even slept in it) to organic chocolate, mushroom teas that held the promise of healing … well, just about anything. 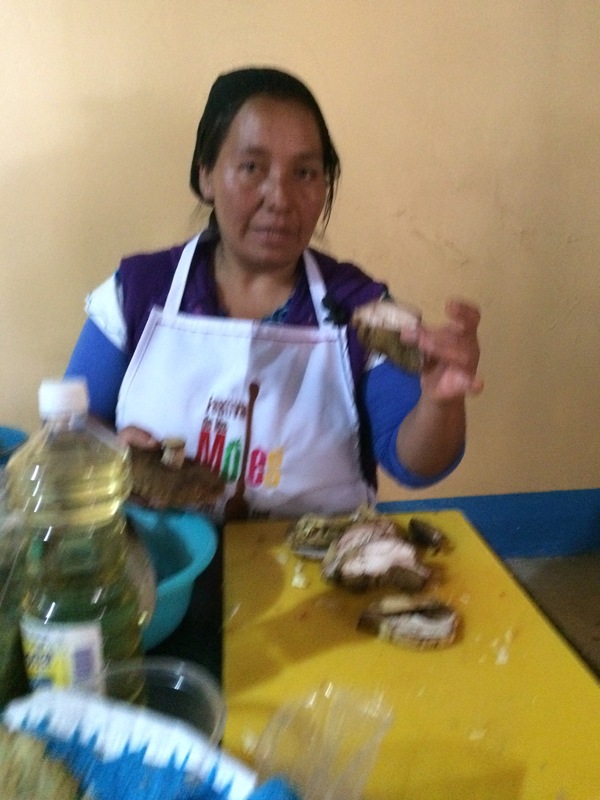 The cooking demonstration was given by Martha Contreras, a local from Cuajimoloyas. 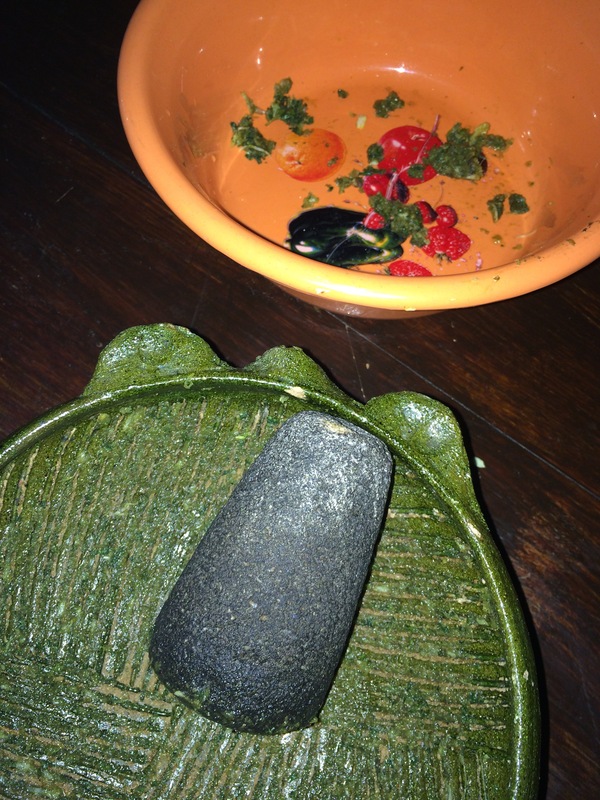 We prepared Amanita caesarea, commonly known in English as Caesar’s mushroom, a la Mexicana, by sautéing the mushrooms with tomato, onion and jalapenos in a large clay pot on an anafre (small tin charcoal brazier). 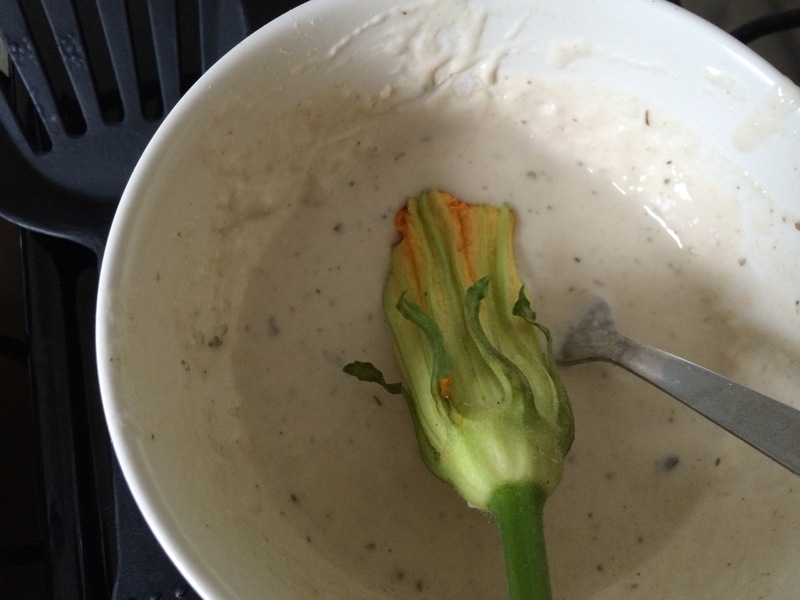 A handful of epazote added a lovely top note and the mixture was rolled up in a potato tortilla. It was my ‘aha’ mushrooms moment. The flavors were so delicate and the mushroom still raw and fresh enough to not be chewy. I came away from the festival with a healthy supply of dried mushrooms, ideas and an excitement for learning more. I met so many interesting people, as the festival attracts biologists, naturalist, birders and mycologists. My father passed away just as I was making Mexico my permanent home, and while he was supportive, he was paternal in his concern. At his funeral, the rich chanterelle stews he was known for were served. A good measure for me is to wonder what he would think if he could see me now. As I trudged through the woods at the Cuajimoloyas festival, suppressing a craving for peanut butter and ginger ale, I think he would have loved it. I just had the pleasure of attending the Cuayimoloyas Mushroom Festival located 3200 meters above sea level and an hour away from the city of Oaxaca. The festival included a guided 5 hour foraging walk through the lush Grimms’-fairytale – like forest, a night in a cozy cabin and incredible local food. The festival attracts mostly naturalists, biologists, birders and of course mycologists. The highlight for me was the cooking class led by Martha Contreras. 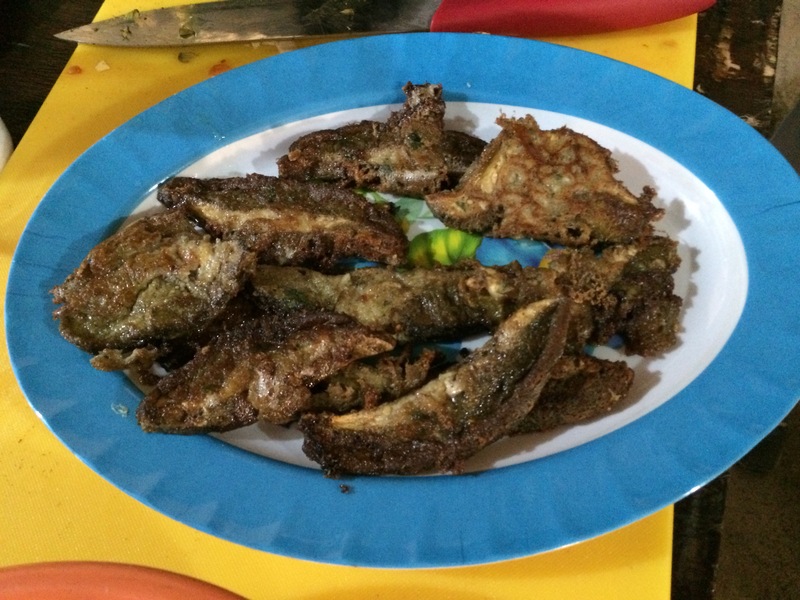 One of the dishes she showed up was deep fried Boletus’- all done on an anafre of course! 1. In a mortar and pestle smoosh 10 small garlic cloves and a handful of fresh oregano until they form a paste. Add 1/2 teaspoon ground black pepper and blend. 2. Slice Boletus’ into 3/4 inch pieces. 3. Add 1/3 cup of water to garlic paste mixture, 3 eggs and 1/2 cup of bread crumbs. 4. 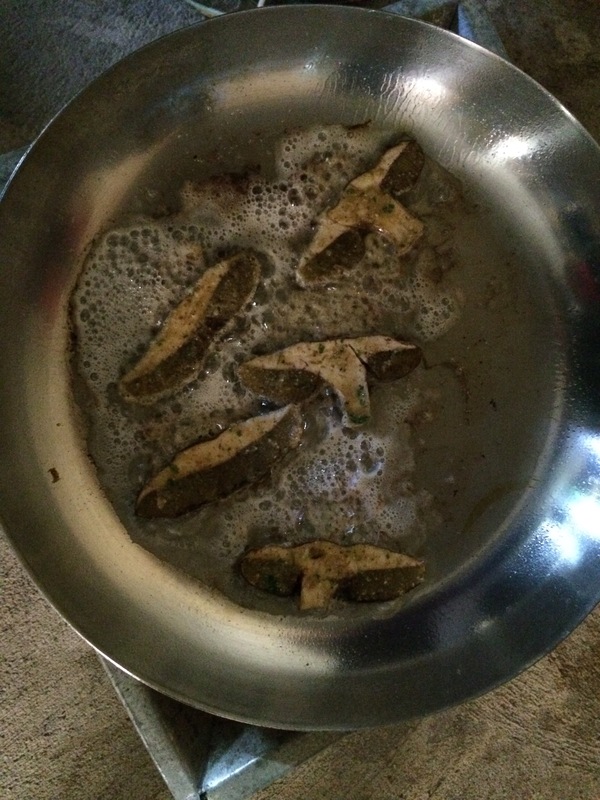 Soak pieces of Boletus in mixture for 10 minutes. 5. Fry in 1/4 of very hot oil until browned. 6. Serve with fresh tortillas. I never really understood the story of Jack in the Beanstalk… who would trade a cow, even a sickly one for beans? There was nothing magical about the beans I grew up with; black or brown types were from cans and green beans were often frozen. At the organic market last Saturday I came across an old woman selling large green pods, luckily she didn’t want to trade them for a sickly cow… 10 pesos would do. I asked her what they were called and she said ‘Cuil.’ She explained that if I opened them up there were two delicacies inside. One was the cotton like pith that surrounded the individual seeds. It was juicy and sweet and I am sure would make a great agua fresca or sorbet. The second delicacy were the seeds themselves. I took the pods back to Cafe Juanita to ask the women I work with if they knew about them. They had eaten the pith but not the seeds. We opened the pods, removed and cleaned the seeds and then boiled them for a few minutes until they began to soften. I drained them and then fried them in garlic oil until they started to brown. 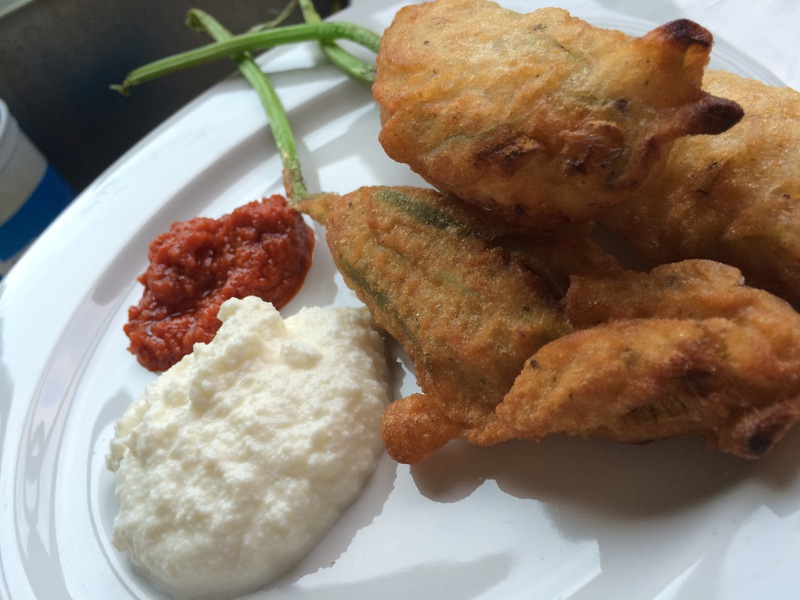 I served them with crumbled queso fresco and a drizzle of our house-made sesame chili oil. The texture was a cross between butter and a chick pea and very flavorful. A true delicacy and worthy of a cow trade! I looked online to see if I could find some more information about these pods but when I googled ‘cuil’ nothing came up. I finally found a reference in Elsevier’s Dictionary of Trees relating the ‘cuil’ to the dogwood. Here is a photo of the dogwood pods and while there is a similarity I am not entirely convinced. I may need to go visit San Pedro Cafetitlan to see the tree for myself. Looking forward to serving this up at our ‘Village to Table’ dinners that we will be starting in October at our Chiles&Chocolate Cooking School. I always find lots of inspiration at our local organic market that is held the first and third Saturdays of the month in Santa Cruz. 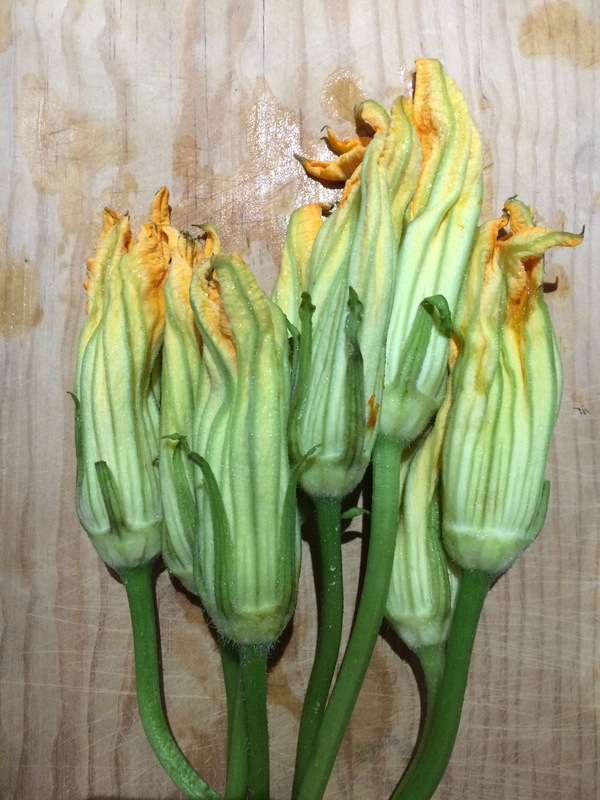 This morning I got some beautiful and fresh zucchini blossoms with the stems intact. I have done several recipes before for stuffed blossoms but have found stuffing them to overshadow their delicate flavor. 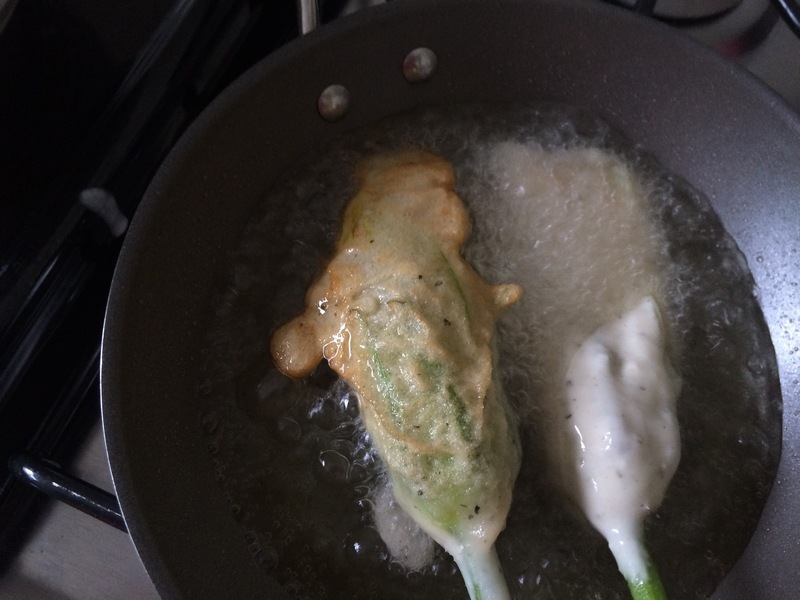 I decided to batter and fry the blossoms while serving the stuffing on the side. Wow! Not only were the blossoms much lighter but they kept their natural shape. I used a simple flour batter with a teaspoon of yeast, salt, Italian seasoning, a splash of olive oil and enough water to make a paste-like consistency. 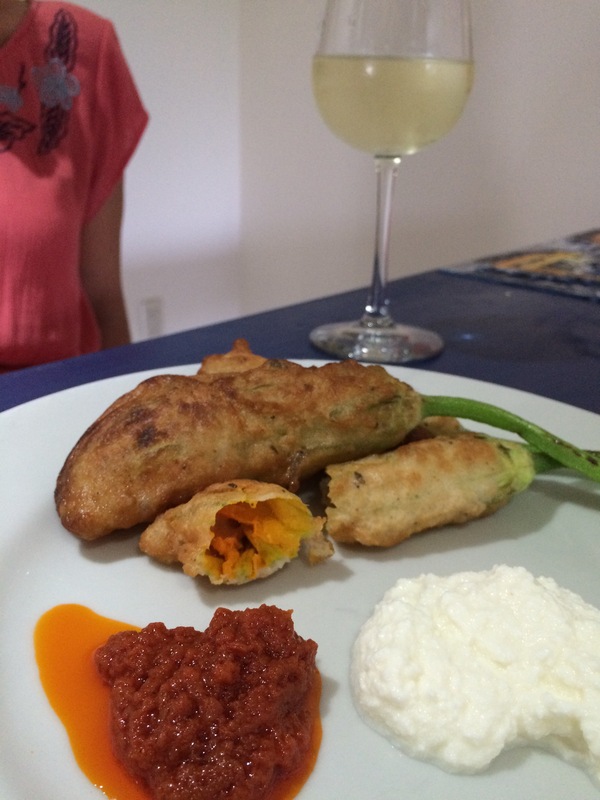 I served them with some fresh ricotta and spicy salsa and a glass of Pinot Grigio for a perfect summer evening meal. Enjoy!